Do you look up to endless paint jobs and your hair full of paint splashes? A spray gun offers you the ideal solution. With an airless or HVLP paint sprayer or paint gun you can prepare a paint job in no time! You no longer have to endlessly brush with a roller or brush, but simply spray the paint on the wall. Are you looking for a do-it-yourself or professional paint sprayer, a latex sprayer or an airless paint sprayer? We have it all, and more! 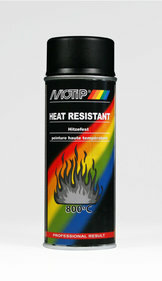 Motip heat resistant clear coat is heat resistant up to 800 ° C.
Paint sprays are available in all shapes and sizes. First of all, you choose whether you want an airless or HVLP spray gun. HVLP stands for High Volume, Low Pressure. The paint is sprayed from the device by air pressure. An airless spraying system also works with high pressure, but without air. Airless systems are generally more expensive than HVLP paint sprays. They give a tighter result, are more widely applicable and suitable for large paint projects. HVLP, on the other hand, gives less spray mist during dyeing and gives a smoother result than painting with a brush or roller. Moreover, parts of an HVLP paint sprayer are easier to clean than from an airless sprayer. After you have chosen between an HVLP or airless spray gun, you can still decide whether you would prefer a paint spray system or paint spray gun. A gun holds you whole in its hand, these are mostly lightweight devices to easily handle small paint projects. A paint spray system is more suitable for large projects because they work faster and have a larger paint reservoir. With a paint spray system you usually leave the turbine on the ground, or you hang the device with a strap over your shoulder. You have the attachment from which the paint comes out. This is attached to the turbine with a hose that varies in length from 1 meter to 15 meters. With some paint spraying systems you have a good range! Apart from the choice between airless or HVLP and a paint gun or paint spray system, you obviously have many more choices to make. Paint sprays usually require a different type of nozzle for different types of paint, so not all paint sprayers can spray all types of paint! When choosing, think about your future paint projects. What type of paint do you want to spray? And is that for a project outside or indoors? For large projects, it is better to buy a spray gun with a large paint cup, but for precise jobs a paint gun with a small paint reservoir is more convenient. In short, think carefully about what you want and choose the sprayer that fits your plans!